A fastball pitcher who spent his 15-year major-league career playing for five teams, Ed Whitson was an All-Star in 1980 and amassed a 126-123 career record in 2,240 innings pitched. The 6-foot-3 right-hander was a starter for the first half of the Pirates’ 1979 championship team, but he might best be remembered for his temper and his rocky tenure with the New York Yankees in the mid-1980s. Eddie Lee Whitson was born on May 19, 1955, in Johnson City, Tennessee, to Starlin and Anna Mae ( Johnson) Whitson. Starlin worked as a logger. Starlin “took off ” when Eddie was 7 years old, leaving a deserted wife and nine children. Eddie’s siblings were Bradford, Buford, Eugene, Dennis, Martha, Trula, Randy, and Susan. Anna Mae and Starlin were divorced on June 4, 1981, exactly 16 years after they were married. Ed Whitson was a star pitcher at Unicoi County High School in Erwin, Tennessee. 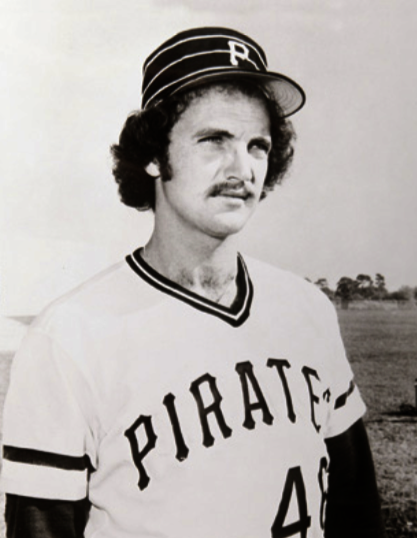 On June 5, 1974, the right-handed fastball pitcher was drafted by Pittsburgh in the sixth round of the amateur draft. Pirates scout Ken Beardslee signed him to a contract and paid him a $5,000 bonus.1 To start his professional career, the 19-year-old Whitson was assigned to the Pirates’ rookie-level team in the Gulf Coast League, where he went 1-4 with a 4.30 ERA in eight games. In 1975 he was moved up to Charleston (South Carolina) of the Class-A Western Carolinas League and finished with an 8-15 mark and a 5.07 ERA. Whitson continued his minor-league career with Salem (Virginia), in the Class-A Carolina League in 1976. By July 4 he was 6-4 with a 1.71 earned-run average and had struck out 78 batters in 84 innings. He finished the season with a mark of 15-9, earning Class-A all-star status. In 1977 Whitson went to spring training with the Pirates, but by the beginning of April, he was sent to the Columbus (Ohio) Clippers of the Triple-A International League. His strikeouts were down, and by mid-June he had but one victory against five defeats, with a 4.35 ERA. On June 30 he suffered his ninth loss in a row, losing to Charleston, 4-2. The Sporting News hinted on August 6, 1977, that Whitson might be superstitious: “After suffering through nine straight losses, he changed his uniform number from 18 to 20 and immediately won his next two starts to up his record to 3-9.”2 Whitson finished the International League season 8-13 with a 3.84 ERA, and was a September call-up to the Pirates. He made his major-league debut on September 4 at Dodger Stadium in Los Angeles. In 1⅓ innings, he allowed a run on three walks and a sacrifice fly, but recorded his first major-league strikeout. Whitson’s first big-league start (and first victory) came via conditions out of his control on September 17, 1977, in Montreal. First, there was a rain delay of over two hours before the contest started. Then, scheduled starter Jerry Reuss was scratched after developing stiffness in his left shoulder while he was getting ready in the bullpen. Manager Chuck Tanner substituted Whitson as the starter. In his five innings, Whitson gave up five hits and three runs. Goose Gossage pitched four innings of scoreless relief as the Pirates won, 6-3. That was Whitson’s only decision in his month with the Pirates. Whitson started 1978 with Columbus but was called up in late May. Pitching in 43 games, all in relief, he posted a 5-6 record with four saves. In the Pirates magical 1979 season, Whitson started seven games and relieved in 12 (2-3, 4.37) before being traded on June 28, along with pitchers Fred Breining and Al Holland, to the San Francisco Giants for infielders Bill Madlock and Lenny Randle and pitcher Dave Roberts. After acquiring Madlock, the third-place Pirates, 6½ games behind first-place Montreal, turned their season around and eventually won the pennant and the World Series. On June 30 Whitson, relieving in the ninth inning of a scoreless duel with the Cincinnati Reds, gave up two runs and took the loss. On August 21, 1979, Whitson duked it out with Giants shortstop Roger Metzger. In batting practice the pitcher was taking some big cuts, and Metzger suggested Whitson concentrate on refining his bunting skills. The players argued, and the spat continued into the clubhouse when Whitson evidently said, “I’ve had enough,” and decked Metzger, knocking him unconscious for about five seconds.3 Both players downplayed the event, and the Giants snapped a six-game losing streak that night. Whitson ended 1979 with a 5-8 record for the Giants, posting a 3.95 ERA, and a combined 7-11 record (4.10). He had 17 starts in 18 appearances. When the Pirates players divided their postseason money, they awarded Whitson $7,000. After the season, on November 24, Whitson and Kathleen A. Mulholland were married in Franklin County, Ohio. In 1980 he was strictly a starter. By June 7 he was just 2-7, both victories shutouts over the Chicago Cubs. By July 1 he had won five straight games and evened his record at 7-7. Two weeks later, Whitson was at the All-Star Game. Vida Blue had been named to the team, but when the Giants placed Blue on the disabled list with a herniated cervical disc, Whitson was named to the National League squad.4 Shortly after the All-Star Game, Whitson developed a blister on the middle finger of his pitching hand and sat out from July 22 until August 15. He finished the 1980 campaign with a record of 11-13 and an ERA of 3.10 in 34 starts (211⅔ innings pitched). Whitson had another slow start in the 1981 season, which was interrupted by a players’ strike. He was the losing pitcher in his first four decisions. On June 2, pitching against the Cincinnati Reds, Whitson felt some numbness in his right arm. The strike allowed him to rest his arm for two months, but his problems continued after play resumed. In an August 18 start against Pittsburgh, Whitson hyperextended his elbow trying to bunt. After the game, he told reporters, “I twisted my arm trying to bunt. I felt a click on every pitch I threw after that, but I won’t miss a turn.”5 Whitson continued to be part of the starting rotation, and he ended the 1981 season with a record of 6-9 and a 4.02 ERA. Whitson’s first season with the Padres also got off to a slow start. He missed the exhibition season with pulled muscles in his rib cage. In a game on April 15 against the Los Angeles Dodgers, Whitson suffered an injured cartilage in his left knee and was placed on the disabled list. He was expected to be gone from the team for three to six weeks, but ended up having knee surgery. When he returned, Whitson became a target for the long ball. A player on another team told him that he was “tipping his pitches,”8 which had led to 16 home runs in 74 innings pitched. After finding this out, Whitson pitched eight innings in his next start without yielding a home run. The next season, 1984, brought new success for Whitson. He developed a palmball by accident in the 1983 season. “The palmball developed in the last half of the season, when I couldn’t use [my] finger,”9 he told reporters. He had cut a finger on his pitching hand opening a soda bottle. This forced him to hold the baseball farther back in his hand. Although known for having a temper, Whitson was ejected from only one major-league game. The Padres had a franchise season in 1984, going to the World Series. Whitson finished the season with a record of 14-8 and posted a 3.24 earned-run average. It was his second winning season. The Padres faced the Chicago Cubs in the National League Championship Series, and Whitson started Game Three, after the Cubs had won the first two games in the then best-of-five NLCS. Before 58,346 fans in San Diego, Whitson allowed just five hits in eight innings as the Padres won, 7-1. The Padres then rallied for comeback wins in Games Four and Five to secure the NL pennant, and went to their first World Series. Whitson started Game Two against the favored Detroit Tigers at Jack Murphy Stadium, down one game to none, and the Tigers hit him hard. After three pitches, Detroit led, 1-0. After 11 pitches, it was 3-0. After 17 pitches, Whitson was pulled for Andy Hawkins. Whitson had allowed five singles while only retiring two batters. The Padres came back to win this game, 5-3, but the Tigers beat the Padres in three straight games in Detroit to claim the World Series title. After the Series Whitson became a free agent and was signed by the New York Yankees to a fiveyear contract for $4.25 million. The fifth starter in the Yankees’ 1985 rotation, Whitson had his traditionally slow start. He allowed 13 runs and 16 hits in eight-plus innings in his first two starts. Only five of the runs were earned, as the New Yorkers made five errors behind Whitson. Whitson was 1-6 with a 6.23 ERA when he started on June 11 against the Toronto Blue Jays at Yankee Stadium. Whitson pitched into the 10th inning and gave up just one run, but the Blue Jays won 4-1 in 11 innings. This night against Toronto seemed special. The fans had been booing Whitson all season, yet in this game, they were chanting, “Ed-die, Ed-die” in the eighth inning. “I didn’t know what was going on,” said Whitson. “One of the guys told me all the beer vendors here are named Eddie and the fans were just yelling for beer.”11 As the season continued, Whitson was getting verbally abused and heckled by the fans. He even began to receive hate mail. He stopped bringing his wife to the stadium. Whitson was involved in a notorious incident on September 22, 1985. In a cocktail lounge at the Cross Keys Inn in Baltimore, where the Yankees were staying, Whitson and Yankees manager Billy Martin became involved in a brawl. The “knock-down, drag out battle” began at about 12:20 A.M. and continued into the hotel lobby and then out into the street.12 Evidently, Whitson was upset about being scratched from a start on September 20. Martin told reporters that Whitson had arm trouble and Ed told reporters he never felt better. The fight became an all-out brawl, with Whitson kicking and punching Martin. At one point, players Dale Berra and Ron Hassey and coach Gene Michael tried to break it up. The peacemakers pushed Whitson outside, but Martin followed. When it was all over, Martin was bleeding from his nose and had suffered a broken right arm. After he pitched to and retired one batter in Yankee Stadium on July 2, Whitson’s ERA stood at 7.54 in 14 appearances. By July 9, 1986, Whitson had had enough. The Padres got him back, trading relief pitcher Tim Stoddard to the Yankees for Whitson, and New York agreed to absorb the remaining 3½ years of Whitson’s contract. Whitson was rescued by returning to San Diego. In four full seasons from 1987 to 1990, Whitson posted double-digit victories (10, 13, 16, and 14). He had been a starter (except for two games at the end of the 1987 season). In 1990 Whitson posted a record of 14-9 with a career-best 2.60 earned-run average. He hit his only major-league home run on April 25, 1990, in a shutout of the Chicago Cubs in San Diego. The 1990 Padres named Whitson as their Pitcher of the Year. The next season, 1991, was Whitson’s last in the major leagues. Again plagued with injuries, he pitched in only 13 games, going 4-6, managing 78⅔ innings in 12 starts and one relief appearance. He gave up 93 hits (13 home runs), and his earned-run average shot up to 5.03, the highest of his career as a starting pitcher. In July he had shoulder surgery. In his final game, on September 29, he allowed five hits and three runs in one-third of an inning in relief against the Reds. The 36-year-old pitcher had a torn ligament in his right elbow. The Padres decided not to renew his contract. When he retired after the 1991 campaign, Whitson had pitched in the major leagues for 15 seasons. His won-loss record was 126-123, and his ERA was 3.79. He pitched 35 complete games, of which 12 were shutouts. As a batter, he had nine doubles and 27 RBIs, in addition to his round-tripper. As a pitcher, he posted one career postseason victory. One sportswriter commented wryly of Whitson’s retirement: “One of the Padres’ all-time leading pitchers retired this week, and it hardly made it off page 17 of area newspapers. Newscasts mentioned it after hockey, of all things.”18 Whitson’s elbow did not get better, and he stayed retired, settling in Dublin, Ohio, his offseason home, spending time with his family. The Whitsons have two children. Jennifer A. Whitson was born in 1982 and Andrew M. “Drew” Whitson was born in 1992. Thanks to Bill Mortell for providing insightful genealogical information and Rod Nelson of SABR’s Scouts Committee. 1. According to Rod Nelson of SABR’s Scouts Committee, Whitson in a SABR questionnaire in 2002 named Beardslee as the scout who signed him. 2. The Sporting News, August 6, 1977: 34. 3. The Sporting News, September 8, 1979: 32. 4. The Sporting News, July 26, 1980: 21. 6. The Sporting News, December 6, 1982: 50. 8. The Sporting News, August 22, 1983: 13. 9. The Sporting News, July 30, 1984: 5. 11. The Sporting News, June 24, 1985: 16. 12. The Sporting News, September 30, 1985: 32. 13. William Juliano, “Considering Kuroda; Remembering Ed Whitson,” captainsblog.info/2011/12/17/considering-kurodaremembering-ed-whitson/10534/. 14. The Sporting News, April 28, 1986: 5. 15. Ian O’Connor, “Whit’s wisdom to Javy: ‘I’ve been there,’ ” sports.espn.go.com/mlb/columns/story?columnist=oconnor_ ian&id=5149683. 16. Whitson had started a game at Yankee Stadium on April 9, 1986, against the Kansas City Royals, but he allowed four runs (three earned) in 2⅔ innings, getting the loss. After that, he pitched three times in April and May in New York, all in relief. 17. The Sporting News, July 21, 1986: 14. 18. Dave Distel, “Whitson Always Was a Real Pro,” Los Angeles Times, November 1, 1992.